Alternately titled, "How to avoid eating your dinner"
2. "I don't have a fork for my pizza." 3. "Look! I got a knife!" 4. "Where's Jonah?" "I think he's under the table." 5. "I'm not sure I like pizza." 7. "Can I have a snack?" 8. "Henry has my drink." 9. "My pizza isn't cut up into bite-sized pieces." 10. "Dad, I'm just not hungry!!!" We've lived in Montana. We know what 'snow' is all about. Our kids, however haven't been quite as fortunate. When we moved from Bozeman, Henry was three and Jonah was one. Bridget hadn't made the scene yet. 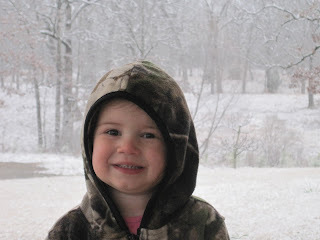 :) So they don't have a whole lot of great memories of snow. 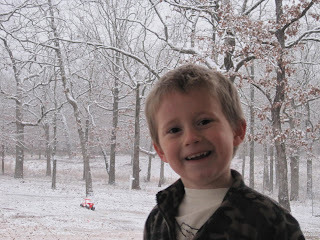 To be perfectly honest, as a toddler Henry just HATED the snow. He wasn't a fan of being cold, didn't like his snowsuit and didn't understand why he had to wear gloves and a hat. Living in an area that can see snow just about any month of the year, that wasn't such a good trait. 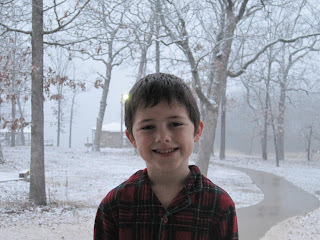 We moved to Texas in spring of 2006. 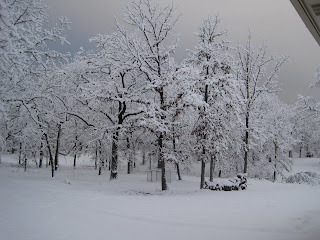 That winter we had a GREAT snow storm. There was enough snow to have a snow ball fight, build a snowman and dive down to make snow angels in. It was great fun for a morning of outdoor play and then it all just melted away. I thought we had found the perfect location. 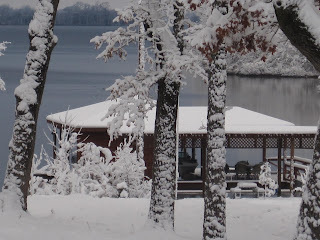 Mild winter, still get some snow...it seemed ideal. Then for the next few winters we didn't see so much as a teeny tiny little snowflake. So this week, when the weather people kept predicting snow, I was skeptical. Actually I uttered the phrase, "I'll believe it when I see it!" They said we would get 2-6 inches. Well 'they' were wrong. WE GOT 8 INCHES!!! And it lasted for two days!!! 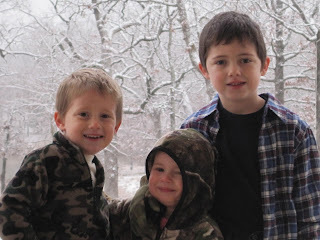 We have had so much fun playing in the snow. 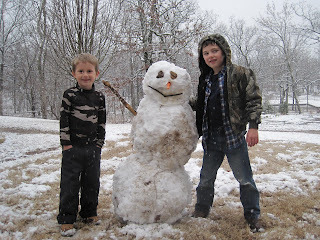 Yesterday the boys built a snowman while the snow kept coming down. It was just beautiful. Today when we woke up there was even more snow and it was just so fluffy and perfect outside. We've had snowball fights. We've made snow angels. 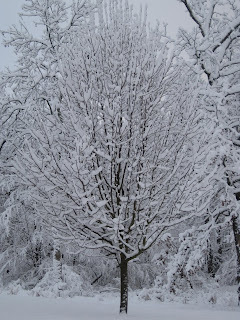 We've shaken the trees to see how much snow we could dump on our heads. We've buried ourselves in the snow. We've hid out in 'snow caves' made out of bent over pine trees covered in mounds of snow. We've changed our clothes eight times because we get so wet and we don't own snow clothes anymore. We've frozen our fingers and warmed them over cups of hot cocoa with mini marshmallows. 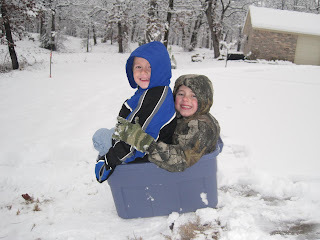 We've sledded down the hill in rubbermaid bins. All in all I'd say we've had enough fun to make up for the lack of snow from the last few years. 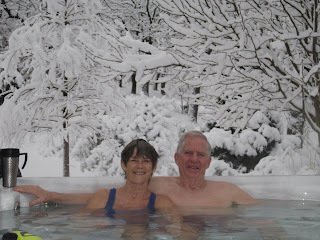 Sam's folks don't let snow stop them...in fact, I think they enjoyed the hot tub even more this morning BECAUSE of all that beautiful snow!!! 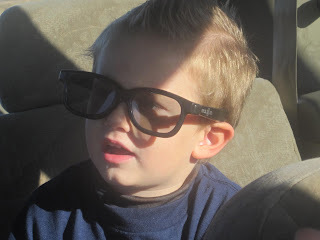 My little Jonah is turning 5 tomorrow. I love kids birthday parties. Seriously. Everything about them. The theme. The cake. The excitement. Snacks. Balloons. Silly games. Party favors and treat bags. Love it all! So with Jonah's big day approaching (and isn't five such a big one? I notice such a change in kids when they go from four to five.) I've had birthday on the brain. However, with everything that is going on around here...the house fire, staying with Sam's parents, MaryBeth's cancer diagnosis...it didn't seem like a great idea to have a party here. And I just LOVE home birthday parties. What's a party planning mom to do? At a loss for ideas, I was looking into a Chuck E Cheese birthday party. You'd have to understand that paying someone else to put on a birthday party for my child goes against everything I stand for. I am a bargain hunter, and I get a total thrill out of finding the best deals and creating parties (or whatever) for the least amount of money. So reluctantly I was searching the CEC sight, realizing that there was really no 'deal' to be found there. In the midst of all this, my mom called. I ended up telling her what I was doing and she was so excited about it. She said, "I'd love to throw Jonah a Chuck E Cheese party!" At first I was a little unsure...I mean, she couldn't even be here! But she agreed that it could be her gift to him and she reminded me of a little story about Jonah that she just loves. My mom was in town visiting and the kids were SO excited to see her. Jonah got my mom's attention and said, "There's someplace that we REALLY want to go with you while you're here. I'll give you a hint...it starts with Chuck-E!" Knowing his love for all things Chuck E, she felt this would be a pretty special thing to do for Jonah. So I planned the party. We didn't tell him. It has been pure TORTURE. I'm not great with secrets. I just get so excited that I want to share them. For the last month Jonah has been trying to take the reigns and plan his own birthday party. He had it all figured out. Just cake, here at Grammy and Grandpop's house. We'll just do it with us, only family. Well, maybe we'll invite Ian and Bella. And we'll probably have ice cream too. Probably Jordan and Matthew would want to come too. And could we play pin-the-tail-on-the-donkey too? What about a pinata? For the last week, he has invited everyone he's talked to over to the house on Sunday for cake. I'm telling you, it's been hard not to say anything. But I didn't. :) Yay me! Last night we had the party and it was so worth the wait!!! Jonah was so blessed and felt so honored by all of his friends and family being there. After he got over the mix-up of the fact that his birthday isn't until Sunday, anyway. He's still a little confused about that. On Christmas day we had a fun family gathering at Sam's parent's house. In the evening just when everyone was getting packed up to leave, MaryBeth noticed a large lump had suddenly popped up on her neck. It was about the size of a golf ball and quite hard. We gathered around her and prayed over her and then debated whether or not she should head to the ER or wait. She ultimately decided to wait a few days, and when it had not changed (except for possibly growing a bit larger) she finally saw her doctor on December 28. He saw her and immediately sent her to the hospital for more testing. She had a contrast cat scan and chest x-ray at that time. After a biopsy and countless other scans/tests/doctor visits and a trip to her nutritionist in Colorado, it was finally determined that MaryBeth has lymphoma (cancer of the lymphatic system). MaryBeth has been working with her nutritionist for a number of years, and he put her on a strict diet (raw vegetables, no animal protein, daily juicing and cleanses) and supplement plan. She has also decided to follow the oncologist's plan of 6-8 treatments of chemotherapy. She had her first chemo treatment today. So far she is feeling great and has a very positive outlook on the whole thing. She is standing on the promise of Isaiah 53:5 (by His stripes we are healed).